Get Caught Up On The Russia Investigation: The 'Collusion' Question Russia attacked the presidential election in 2016. Did any Americans conspire to help the cause? Here is why the special counsel was investigating that question and why Congress continues to do so. U.S. President Donald Trump and Russian President Vladimir Putin answer questions about the 2016 election during a joint press conference after their summit on July 16, 2018, in Helsinki, Finland. Justice Department investigators did not establish that Donald Trump or his campaign conspired with the Russians who interfered in the 2016 presidential election, Attorney General William Barr told Congress on March 24, 2019. Special counsel Robert Mueller spent nearly two years looking into that question and submitted his report to Barr, who then described some of its findings in a letter to lawmakers. Here's some background about the collusion allegation and Trump's 2016 campaign. Why was Trump's campaign investigated for potentially conspiring with the Russian attack on the election? Because of something that happened early in 2016: Trump, a political newcomer who had never served in the military or held elective office, was criticized for his lack of experience and faced pressure to name a team that would advise him on national security and foreign policy. Once he did, people on it began to receive overtures from Russians or their agents. One adviser, George Papadopoulos, was working overseas in London. He began to hear from foreigners who offered him "dirt" on Trump's opponent, Hillary Clinton, and "off the record" meetings between Trump or campaign officials and leaders in Russia. Papadopoulos communicated about these overtures to his bosses in the 2016 campaign, although he later said he couldn't remember what he said. At the time, though, Papadopoulos told an Australian diplomat about the Russian offers during a night of heavy drinking. That Australian told his government, which told the United States, which prompted the FBI to begin, in July 2016, a counterintelligence investigation about the Russian outreach. That led the FBI to investigate Papadopoulos and other people in the Trump campaign and to monitor other aspects of the Russian active measures campaign against the United States. Former FBI Director Robert Mueller was appointed to take on the investigation on May 17, 2017. Mueller finished his work on March 22, 2019, and submitted a confidential report, as required by Justice Department regulations, to Attorney General Barr. There were a number of other electronic or personal contacts between people in the 2016 Trump campaign and Russians. Another junior foreign policy adviser, Carter Page, traveled to Moscow and met with Russian officials. U.S. officials considered him "an agent of a foreign power" and collected his emails and phone records. Page wasn't charged in the course of the Mueller investigation and says he has done nothing wrong. The 2016 Trump campaign distanced itself from him and said he was no longer on its team at the time of his travel to Moscow. Some supporters of President Trump have since said they consider Page to be a victim of overreach or a conspiracy by federal law enforcement. A senior adviser, then Sen. Jeff Sessions, met with Russia's then ambassador to the United States, Sergey Kislyak. Other people in the Trump orbit had different connections to Moscow. Trump's sometime campaign chairman, Paul Manafort, and vice chairman, Rick Gates, had spent years in the employ of a Ukrainian politician, Viktor Yanukovych, who was a loyal ally of Russian President Vladimir Putin. Yanukovych lives in Russia now, after being forced from power. Manafort continued to correspond with at least one person with ties to Russia's intelligence agencies even after he was charged with conspiracy, money laundering and other alleged crimes. Earlier, Manafort also allegedly discussed 2016 polling data with his associate, a Russian named Konstantin Kilimnik, according to court documents. Prosecutors have connected Kilimnik with Russia's military intelligence agency, the GRU. Manafort has been sentenced to about 7 1/2 years in prison following two federal cases, one in Virginia and one in Washington, D.C. The cases were connected to his political work for powerful clients in Eastern Europe but didn't involve allegations as to whether he conspired with the Russians who interfered in the 2016 election. Kilimnik was indicted on federal conspiracy, obstruction and other charges in Washington, D.C.
Gates pleaded guilty to charges including conspiracy in early 2018 and has not yet been sentenced; he has been cooperating with prosecutors. — In May 2016, Republican fundraiser Paul Erickson emailed contacts on Trump's campaign offering to set up a back channel with the Russian government through the National Rifle Association. His girlfriend, a Russian woman named Maria Butina, has pleaded guilty to conspiring to serve as a Russian agent within the United States. Erickson is facing criminal charges of his own that do not directly relate to the Russia imbroglio. He has pleaded not guilty. — In June 2016, Donald Trump Jr. received, through a series of intermediaries, what was described as an offer of support from the Russian government. He agreed to host a delegation of Russians at Trump Tower to hear their pitch. Manafort and Trump Jr.'s brother-in-law, Jared Kushner, also attended. The contents of the meeting are disputed. The president has denied authorizing the conference beforehand or being aware at the time that the meeting happened, but people who worked for him have said they believe Trump was aware of it. Separate and apart from any allegations of colluding with the Russian election interference, it is illegal for American political campaigns to accept anything of value from foreigners. — Trump Jr. communicated directly with WikiLeaks, which Russia's intelligence agencies used to release the emails stolen via cyberattacks against American political targets. — Republican political consultant Roger Stone has been charged with lying to Congress about his indirect communications with WikiLeaks. Prosecutors say he didn't tell the truth about how he and associates served as intermediaries between Trump's campaign and WikiLeaks founder Julian Assange in 2016. Stone has pleaded not guilty. — Kushner and Trump's national security adviser, Michael Flynn, met with Kislyak on Dec. 1, 2016, in New York. Then Kushner met with the head of a state-controlled Russian bank in New York on Dec. 13. Kushner says that the meetings were relatively brief, uneventful contacts that had nothing to do with the active measures campaign and that he did nothing wrong. — Flynn talked with Kislyak starting on Dec. 28, 2016, about punitive measures that the outgoing Obama administration was imposing against Russia in retaliation for its interference campaign. Flynn communicated the wishes of the Trump transition team that Russia not respond with punitive measures of its own and escalate the situation. He called on Russia's government to wait until Trump was in office. Putin agreed, and Trump praised him for his restraint. — Flynn has pleaded guilty to lying to the FBI about his conversations during this period and cooperated with the Russia investigation. He could be sentenced in the summer of 2019. None of these contacts proved that Trump or anyone in his 2016 campaign played an active role in the Russian interference campaign. Everyone involved insists they've done nothing wrong. Mueller hasn't recommended any more indictments beyond those known to the public and there aren't any more sealed cases waiting to be revealed, Barr told Congress. 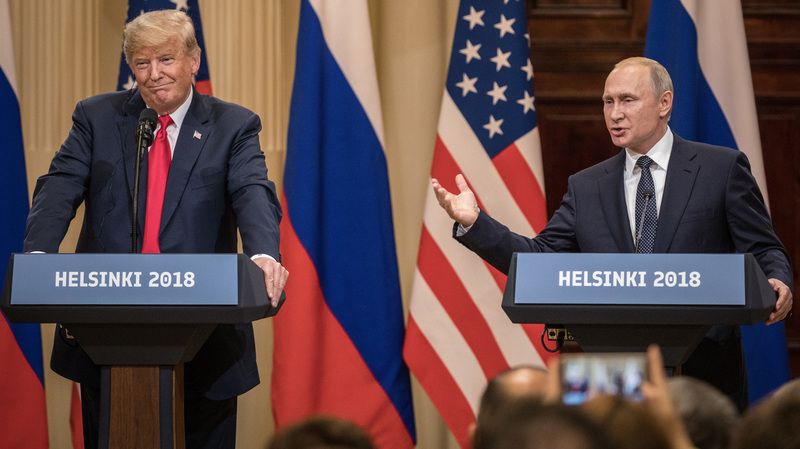 Trump campaigned in 2016 in part on the need to improve U.S. relations with Russia, but the relationship between the two powers remains officially chilly. They've closed diplomatic missions in each other's territory and have expelled the other's diplomats. Trump has, however, continued to govern with the stated goal of forming a better relationship with Moscow and reportedly sometimes conceals details of his conversations with Putin from his own top aides. As the presidential campaign was underway in 2016, a private intelligence firm in Washington was paying a former British intelligence officer, Christopher Steele, to research Trump's relationships in Russia. That work, which was underwritten by Democrats, yielded the dossier and its infamous allegations about Trump and Russia. The dossier made sensational headlines when it appeared publicly in early 2017 but remains unverified. Read more about that here. The FBI has substantiated some of its contents, but there is little detail about how much or which parts.